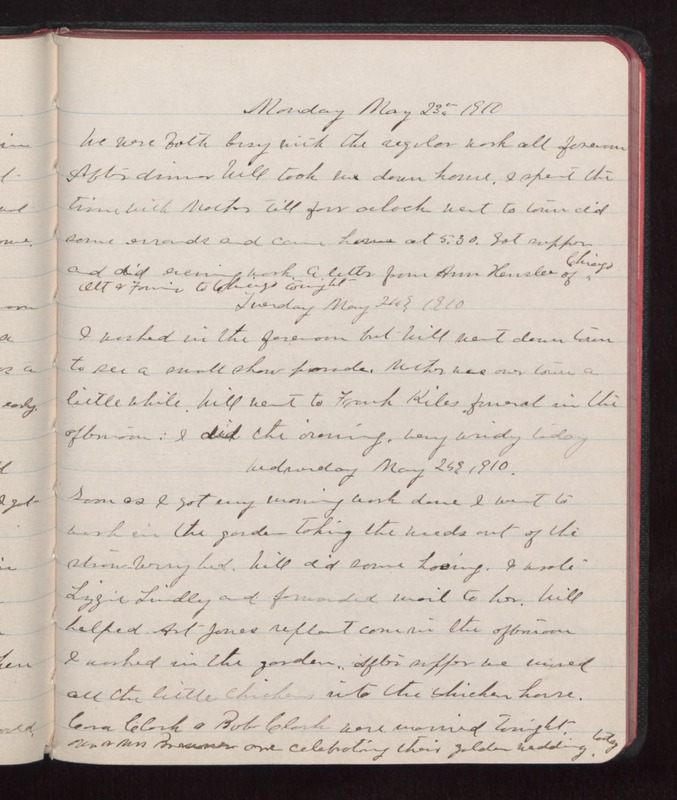 Monday May 23 1910 We were both busy with the regular work all forenoon After dinner Will took me down home. I spent the time with Mother till four oclock went to town did some errands and came home at 5.30. Got supper and did evening work. A letter from Ann Hensler of Chicago. Ott & Fannie to Chicago tonight Tuesday May 21 1910 I washed in the forenoon but Will went down town to see a small show [illegible]. Mother was over town a little while. Will went to Frank Kiles funeral in the afternoon. I did the ironing. Very windy today. Wednesday May 24 1910. Soon as I got my morning work done I went to work in the garden taking the weeds out of the strawberry bed. Will did some hoeing. I wrote Lizzie Lindley and forwarded mail to her. Will helped Art Jones replant corn in the afternoon I worked in the garden. After supper we wired all the little chickens into the chicken house. Cora Clark and Bob Clark were married tonight. Mr & Mrs [Bremer?] are celebrating their golden wedding today.